Wiley Drake, a former Southern Baptist Convention officer, says the the murder of George Tiller was an answer to "imprecatory prayer" and that he is praying for Barack Obama's death. Drake says that imprecatory prayer (praying for the misfortune or death of one's enemies) is found throughout scripture, particularly in the Psalms. And he's right about that. Here are some of the verses from Psalms that Wiley especially likes. Most Christians are embarrassed by these verses, as they are with most of the Bible. Maybe it's time for them to admit the obvious: the Bible is not a good book and it was not inspired by a kind and loving God. Your blog is a brilliant religion research data source. Viva creative Brick Testament and statistical analysis of Biblical content. Modern Christians (those of them who are more thinking and less emotional) may criticize your for "biblical literalism", implying that they see "symbolic content" and "hidden messages from god" in the book, so maybe you can dedicate one post to that. Like, finding hidden symbols of godly wisdom in Harry Potter. Most Christians are apologists of god. Whatever god does is his right regardless of how bad, evil and neurotic it is. But if you edit out all the imprecatory prayers the books of the prophets & Revelations will disppear. As usual, I am enjoying your posts. Despite trying to convince everyone that one has to believe in god to be moral, Christians are praying for Obama's death? Hmm ---wonder what they consider to be moral about that? I hated George Bush, I mean I HATED him, but I never wished his death. Part of my reasoning was that President Cheney would have been more frightening to me than President Bush, but still, I wouldn't wish anyone's death. And I'm an atheist. I'm claiming the moral high ground on this one. Of course you already know most Christians have never read the Bible, or at least not much of it. If they had, I'm sure there wouldn't be so many of them. Reading the Bible turned me away from religion more than 50 years ago, when I was 12, and nothing I've heard or read since has convinced me that I made the wrong choice. 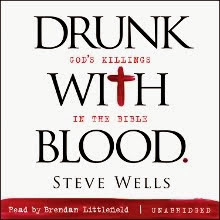 You know, the reason I became an atheist is because I actually read most of the Bible in my youth, and what I found there was incredibly disturbing; the first instance of this was when I was 13, and stumbled upon that lovely story in the Book of Judges where a man lets his concubine be raped and murdered, cuts her body into portions, and has the land of Israel declare war on the tribe where the people who killed his concubine were from. Nice morals, wouldn't you agree? To: Matt311 ---that Bible story is also one that horrified me when I was a teen. I wrote about it on my blog post "Why I am An Atheist - The Bible Part 1." My family read a chapter of the Bible before dinner each night, so I plowed through it with them, reading it cover-to-cover about three times, before leaving for college and finding some rational people. It is just one of many Bible stories about women ---they aren't allowed to speak in church, are worth half a man, etc. ---that made me doubt the existence of god. When looking for horrific acts perpetrated by god, or those directed by god, there are so many stories to choose from, including those sited on the Dwindling in Unbelief blog. Now, The Melodians made a great song using parts of this Psalm, but for reasons obvious, left out verse 9. I guess they realized that making beautiful harmonies about dashing babies against stones would work too well as a pop song. Oh yes. The Quran looks so peaceful in the light of these Bible verses.